Italy Faculty — Classic Lyric Arts, Inc.
Meet the Classic Lyric Arts Italy faculty. Paolo Baiocco's early studies in music as well as classic and modern dance led to his graduation from the Classic High School, and in 1980 he received a degree in Architecture, with a focus on the origins of Italian Theater. He studied acting and theatrical production with director and theorist Jerzy Grotowski in Pontedera, and in Denmark at the Odin Teatret under Eugenio Barba. In 1980 he founded his own theater company, producing over 30 classic and contemporary plays. Two of his own works were published in the theatrical magazine, SIPARIO. In 1982 he appeared as an actor/mime in Franco Zeffirelli’s film of La Traviata with Placido Domingo and Teresa Stratas, as well as in Pierluigi Pizzi’s production of La Battaglia di Legnano at the Opera di Roma, leading him to a career in opera as a director and set and costume designer. He collaborated with writer and director Giorgio Pressburger, and has written screenplays for both television and film. Mr. Baiocco has directed operas internationally in Japan (Tokyo and Osaka), France (Tours and Rouen), Greece (Festival of Tessaloniki), Spain (Barcelona) Hungary (Budapest), Korea (Seoul and Daegu), the Mongolia National Opera, the National Theater of Belgrade and the National Theater of Cyprus. In Italy he directed operas for the Lyric Theater of Spoleto, the Maggio Musicale in Florence, the Theater of Sassari, the Verdi Theater in Messina (Sicily), the Teatro dell’Opera in Rome as well as at festivals in Tolentino and Narnia and for the Brunello Cucinelli Foundation. For La Scala he directed 25 opera-videos about Maria Callas and planned the exhibition marking the 25th anniversary of her death. He also created tributes to Callas for theaters in Genova and Ischia. He has worked at the University of Perugia as Professor of Performing Arts and Stage Direction, and has directed young opera singers at the Narnia Festival and in workshops in New York City. Emanuele Moris was born in Imperia (Italy) in 1938. At an early age he showed a great interest in classical music which eventually became his profession. He studied flute in Torino with Maestro Arturo Danesin and singing with Maestra Morano. After many of years as a flutist with symphony orchestras and opera theathers in Italy as well as serving as conductor for the “Orchestra da Camera di Torino” in concerts internationally, he moved to London to study conducting with the great English conductor Sir Adrian Boult, who advised him to puruse a career as an operatic coach. Since 1983 he has been Professor of Italian Repertoire and Italian Language for singers at the Guildhall School of Music & Drama. He is also a coach at the Royal Opera House, Covent Garden, both for main stage productions as well as for the Jette Parker Young Artist Programme and the National Opera Studio. Additionally he works with the BBC Symphony Chorus, the English National Opera, and Opera North (Leeds). He is also a visiting Professor at the Royal Scottish Academy of Music and Drama (Glasgow). He has led productions with New Opera NYC, Morning Side Opera, Amato Opera, Boston University, and Company XIV and has appeared as guest conductor at Teatro Grattacielo, Harlem Opera Theater, Oregon Bach Festival, and Siena Summer Music Festival. Since 2010 Mr. Fusco has been music director for ¡Figaro 90210!, the critically-acclaimed, modern adaptation of Mozart’s Le Nozze di Figaro by Vid Guerrerio. He has performed as harpsichordist and pianist in Carnegie Hall, Le Poisson Rouge, The Kimmel Center, Tuscia Opera Festival, Teatro degli Astrusi and other renowned venues. Praised “a lively player and fine improviser” by the Los Angeles Times, he has worked with world class artists and ensembles including Branford Marsalis, Daniel Rowland, American Ballet Theatre, Chamber Orchestra of Philadelphia, and members of the New York Philharmonic and Metropolitan Opera Orchestras. He has received awards from the Alienor Harpsichord Competition, American Prize for Music, Bohuslav Martinu Composition Competition, and two artist residencies at the Piccola Academia di Montisi. Mr. Fusco holds degrees in composition and piano from the Mannes College of Music and completed studies at the Conservatorio G. Verdi di Torino, Vienna Konservatorium, and Paris Schola Cantorum. Stefano Sarzani cultivates an international career in both North America and Europe. 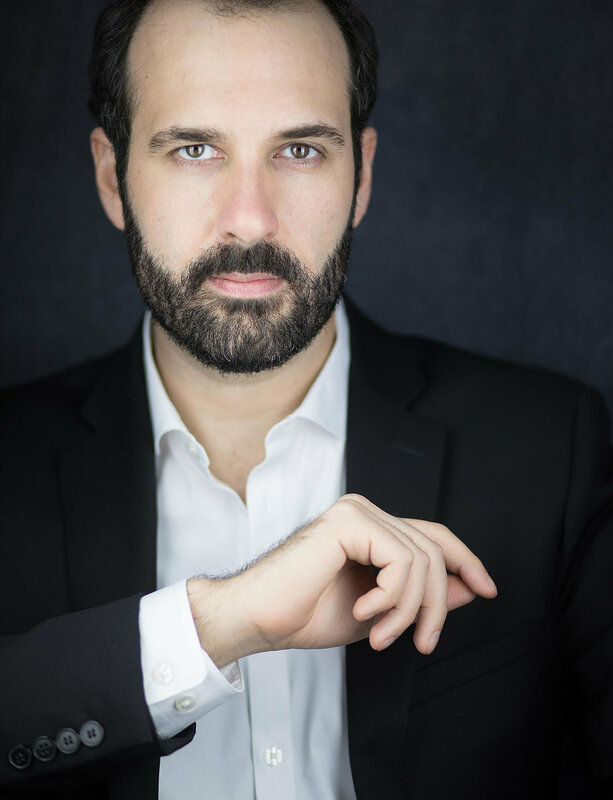 In the summer of 2017, he will be back at Des Moines Metro Opera, conducting Piazzolla's masterpiece Maria de Buenos Aires and as associate conductor for Turandot. His recent engagements include conducting Suor Angelica and Gianni Schicchi at the University of Memphis and symphonic concerts with Filarmonica Marchigiana (Italy). Lately, he has also worked for the Danish National Opera and Opera National de Lorraine (France). He returns to the Lyric Opera of Chicago this year as assistant and cover conductor for La Bohème and Il Trovatore. Mr. Sarzani is recipient of the Solti Foundation U.S. Career assistance Award 2016 and he has collaborated with symphonic and operatic institutions such Boise Philharmonic Orchestra, National Repertory Orchestra (Colorado), Orchestra Sinfonica di Sanremo, Atlanta Opera, and Sarasota Opera. Equally versed in symphonic and operatic repertoires, he is also invested in cultivating interactions among music, multimedia, and other art forms: in Cincinnati his multi-art project (music-dance-poetry-visual art) on Das Lied von der Erde received great acclaim. Her roles include Mimì (La Bohème), Cio-Cio San (Madama Butterfly), Desdemona (Otello), Violetta (La Traviata), Liù (Turandot), Magda (La Rondine), Micaela (Carmen), Adalgisa (Norma), Thérèse (Les mamelles de Tirésias), and the title roles in Maria Stuarda, Belisario, Adriana Lecouvreur and Suor Angelica. She has performed at prestigious theaters throughout Italy and France such as La Scala (Milan), Arena di Verona, San Carlo (Naples), Teatro Comunale (Florence), Teatro Regio (Parma), Théâtre Royal (Versailles), Théâtre du Châtelet (Paris), as well as Zurich Opera, the Staatstheater of Stuttgart and Michigan Opera Theater (US debut), working with directors such as Franco Zeffirelli, Johathan Miller, and Francesca Zambello, and conductors such as Eve Queler, Daniel Oren, Jeffrey Tate, Roberto Abbado, Lorin Maazel and Placido Domingo. Ms. D'Annunzio Lombardi has been awarded the prestigious Albo D’Oro Giacomo Puccini from Torre del Lago, the Victoire de la Musique from the Théâtre du Châtelet, Paris, and the first prize from the Francesco Paolo Tosti International Competion. She is considered one of the leading interpreters worldwide of the music of Tosti. She is also committed to working with emerging young artists, teaching bel canto technique and interpretation at Daltro Canto (Rome), L’Istituto Tostiano (Tokyo and Ortona), and has coached students at the Manhattan School of Music and Mannes College (New York), and with Classic Lyric Arts, Italy. A native Italian speaker, Ilaria Ciccioni has developed an interest in foreign cultures and languages. She graduated in 2004 from the University of Bologna with a master’s degree in translation and conference interpreting. Since 2002, she has worked as a teacher of Italian for international students in various private schools, where she has combined her interest in language with her love for culture, art and history. Her teaching method involves comparative studies of grammar rules between Italian and other languages, as well as speaking and listening activities. Ms. Ciccioni also offers field trips to many artistic and historical sites, especially in the Montefeltro and Valmarecchia regions. She is currently a freelance translator and interpreter, having received post-graduate training in translations of law related documents, and is a member of the Italian Translators and Interpreter’s Association–AITI. She is a permanent faculty member of Voci nel Montefeltro, and in 2008 received the DITALS ll certificate for teachers of Italian as a second language, from the University of Siena.